I will openly admit that I am addicted to this series. I love the idea of a MC that is made up strictly of vets. You must have served and you must be clean--no drugs allowed. The Dead Presidents MC have an important mission-- to help other vets, to help the community, to live, to survive. Eagle has sworn off relationships. As a sniper he watched his girlfriend, a women he was supposed to protect, die after driving over an IED. How does one come back from that??? You live, survive with the support of your brothers in arms, the Dead Presidents. He works. He plays. He follows the rules. The rules were easy before he met Naomi, Link's sister. As the president's sister she was off-limits, untouchable. The Helo pilot has other ideas. She is only back in Seattle for a few days and Eagle is just what she needs before her next mission. Love'm and leave'm has never been so challenging for both of them. Time may pass, but out of sight out of mind could not be farther from the truth. Another visit, another romp. Stories told. Memories made. Hearts broken. Another good bye and more nightmares to pass the nights. True love refuses to remain quiet. Soul mates cannot fight the truth. The challenges will be many. Complications add a lot of great drama. But it was the unexpected that blew me away, had my mouth dropping, my skin crawling, a nail biting nervousness ensued. Would it all be destroyed before it really began? This Eagle landed a 5 star review! Just when you think the series could not get any better.. this book comes out! There are not a lot of authors out there right now really focusing on what it is like for soldiers to come home. Harley Stone does an amazing job addressing those issues with respect and depth of the emotions involved. Oh and did I also say that Naomi and Eagle have off the charts chemistry and this is a sizzling romance... yeah there is that as well. This book follows two people who have to deal with their pasts in different ways and find away to move on with love. There is also some action and suspense to add to an already amazing plot. We also get to catch up with the other couples from the series. I cant say enough about how much I loved this book and I that everyone should run out and read it right now. I love Naomi & Eagle!!!! The Dead Presidents MC is a series about an MC comprised of former military. Each book in the series focuses on a different couple, but the characters reappear in all of the books. 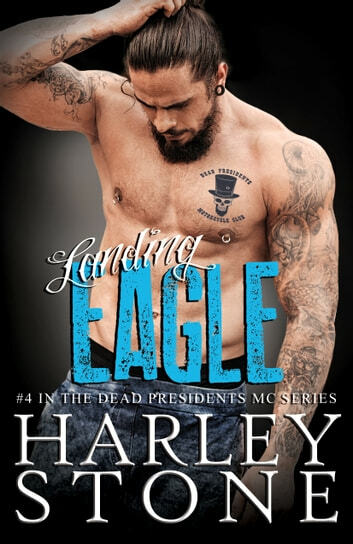 Book four is about a former marine sniper, Eagle, and the sister of the MC's President, Naomi. Naomi is a hotshot helicopter pilot in the Air Force. She is the toughest of the tough, the baddest of the bad. She goes in to rescue those that need it in combat. She is a fierce, confident woman, who can stand on her own. But she can't stay away from Eagle, even when she wants to. Eagle has his own issues that haunts him, keeping him from moving forward with his life but even he can't resist the immediate connection between them. The chemistry between Naomi and Eagle is HOT! I loved their flirty interactions, and the witty barbs they tossed at each other. The action, drama, and suspense kept the story moving at a fast pace. This book is perfect for anyone that enjoys forbidden romance, MC stories, or military stories.